Alex Smalley (USA), a sophomore at Duke University, earned medalist honours in the U.S. Amateur Stroke Play Qualifying. His 133 (-7) total came after two impressive rounds at Oakland Hills CC; a 65 on the North Course, followed on Day 2 by a 68 on the tougher South Course. 56 players scored +1 or better. This group, all of whom have confirmed their places in the Match Play Stage, included 4 GB&I players. Well done to Scott Gregory, Sam Horsfield, Connor Syme and Jack Hume. From Europe the following players have also safely negotiated the Stroke Play Qualifier. A further 23 players finished with a +2 total. This group included David Boote and Bradley Moore. They all participated in a sudden death play-off played over the 10th, 11th, 17th and 18th holes of the North Course. From Europe just one other player made it through to the play-off. David Boote and Bradley Moore both birdied the 11th to progress to the match play stage, holing putts of 20 and 45 yards respectively on the 465 yard par 4. Federico Zucchetto bogeyed the 17th to drop out of the play-off on the 3rd hole. WAGR-ranked no. 1 Maverick McNealy (USA) also missed out bogeying the 10th, the 5th play-off hole. The U.S. Amateur Championship starts tomorrow at Oakland Hills Country Club, just north of Detroit in Michigan. Administered by the United States Golf Association (USGA) the U.S. Amateur is without question the most important and prestigious competition in the amateur golf calendar. On Monday 15th and Tuesday 16th August all of the contestants will play 36-holes of stroke play, one on each of Oakland Hill’s two courses.The Top 64 qualifiers will then move forward to the match play stage of the competition. Ties for the last qualifying place will be resolved by a hole-by-hole play-off. 18 hole match play rounds will be played between Wednesday 17th and Saturday 20nd, culminating in a 36-hole Championship Final on Sunday 21st August. Extra holes will be played in the match play to resolve any halved games. Oakland Hills CC, established in October 1916 and therefore celebrating it’s centenary this year, consists of two championship courses – the South and the North. The former is extremely challenging with a notorious finish. As the superior course the South will exclusively host the match play stage. Distance – 7,334 yards, Par 70. Distance – 6,849 yards, Par 70. A field of 312 players from 29 different countries will contest this year’s Championship. 247 players are from the U.S.A. with Canada (13) the next best represented country. The decision by the U.S.G.A. in 2012 to exempt the Top 50 in the World Amateur Golf Rankings continues to help broaden the entry. This year 99 (2015: 97) 36 hole Sectional Qualifying events were held in July across the USA, with one each in Canada and Mexico too. Just in case anyone from the U.S.G.A. reads this it would be great to see one in GB&I or Europe in the future too – just like they do for the U.S. Open Championship. This year’s average competitor age is 22.29 (2015: 22.16). The oldest player being Chip Lutz (61, b.11th January 1955) and the youngest Edwin Kuang (15, b. 1st August 2001), one of three 15 year olds playing. Lutz is the reigning U.S. Senior Amateur champion who won the Seniors Amateur Championship at Formby GC last weekend before flying to Ohio to take his place in this week’s U.S. Senior Open. Having made the cut he is due to play in the final round before travelling to Oakland Hills for a 2.10pm (local time) tee time tomorrow. Following heavy rain today at Scioto CC and an almost certain Monday finish it will be interesting to see what Mr. Lutz decides to do. Surprise 2014 champion Gunn Yang is the only former U.S. Amateur champion in the field. 70 of this year’s players also competed in last year’s Championship at Olympia Fields CC near Chicago. Mon 15th August – Showers. Wind 6 mph (N). Temp. Max. 25°C / Min 21°C. Tues 16th August – Showers. Wind 10 mph (NW). Temp. Max. 25°C / Min 20°C. Weds 17th August – Sunny. Wind 6 mph (E). Temp. Max. 28°C / Min 21°C. Thurs 18th August – Sunny. Wind 6 mph (E). Temp. Max. 29°C / Min 22°C. Fri 19th August – Sunny. Wind 7 mph (N). Temp. Max. 30°C / Min 22°C. Sat 20th August – Showers. Wind 9 mph (NE). Temp. Max. 29°C / Min 21°C. Sun 21st August – Sunny. Wind 10 mph (SE). Temp. Max. 26°C / Min 18°C. The forecast rain is likely to come with thunderstorms so suspensions in play are possible during the week. If the current weather forecast proves to be accurate it may have a significant impact on the stroke play qualifying depending on the timing of the rain on both days. From GB&I Jamie Bower, David Boote, Jack Hume, Jack Singh Brar and Connor Syme are playing the tougher South on Monday. Oppositely Ewen Ferguson, Grant Forrest, Scott Gregory, Sam Horsfield, Robert MacIntyre and Bradley Moore are scheduled to play it on Tuesday. Last year nine GB&I players competed at Olympia Fields CC. Paul Dunne (IRE) was our best finisher reaching the quarter finals of the match play (MP) stage – he lost to the eventual champion Bryson DeChambeau (USA). 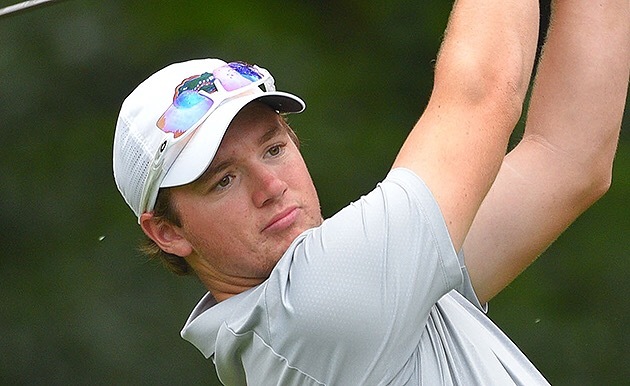 Sam Horsfield (ENG) was our only other player to make the Top 64 MP cut which fell at +3. History has shown, that the quality of the field is such, that simply making the match play cut is an achievement for many of the GB&I and European players that qualify to compete in the Championship. Sat 20th August – Sky Sports For iPad 8.00 pm. a) A Gold Medal and custody of the Havemeyer Trophy for the ensuing year. b) An exemption to play in the 2017 U.S. Open at Erin Hills. c) An exemption to play in the 2017 Open Championship at Royal Troon G.C. d) A likely invitation to play in the 2017 Masters at Augusta National G.C. f) Invitations to play in a variety of PGA Tour and European Tour competitions. A Silver Medal is awarded to the runner-up and Bronze Medals to the two semi-finalists. The original silver Havemeyer Trophy was presented to the USGA on March 1895 in honour of the Association’s first President Theodore A. Havemeyer. This was lost in a fire at Bobby Jones’ home club, East Lake, in 1925. A new gold trophy was produced in 1926. This was retired in 1992 with a copy of the trophy being produced and passed from champion to champion ever since. Sadly the original gold trophy was stolen from the USGA Museum in 2012 and has never been seen since. The U.S. Amateur is the oldest golf championship in America and this will be its 116th playing. It was first played in 1895, the winner being Charles B. Macdonald. It has always been decided by match play save for an 8 year period between 1965 and 1972 when the winner was determined solely by stroke play. Former US winners include Jerome Travers (1907-08-12-13), Bobby Jones (1924-25-27-28-30), Francis Ouimet (1914-31), Arnold Palmer (1954), Jack Nicklaus (1959-61), Deane Beman (1960-63), Lanny Wadkins (1970), Craig Stadler (1973), Mark O’Meara (1979), Hal Sutton (1980), Phil Mickelson (1990), Justin Leonard (1992), Tiger Woods (1994-95-96), Matt Kucher (1997) and Peter Uihlein (2010). British players have won the Championship on six occasions but just twice in the last 100 years – H.J. Whigham (1896-97), Findlay Douglas (1898), Harold Hilton (1911), Richie Ramsay (2006) and Matthew Fitzpatrick (2013). Italy’s Edoardo Molinari (2005) is the only player from the Continent of Europe to have lifted the Havemeyer Trophy. Last year Bryson DeChambeau, who had already won the NCAA Division 1 Individual title earlier in the summer, completed a memorable double beating compatriot Derek Bard 7&6 in the 36 hole Final. Copyright © 2016, Mark Eley. All rights reserved. This entry was posted in U.S. Amateur Championship and tagged Antoine Rozner, Bradley Moore, Chip Lutz, Connor Syme, David Boote, Edwin Kuang, Ewen Ferguson, Federico Zucchetti, Grant Forrest, Ivan Cantero, Jack Hume, Jack Singh Brar, Jamie Bower, Luca Cianchett, Mario Galiano, Matthias Schwab, Oakland Hills Country Club, Robert MacIntyre, Robin Petersson, Sam Horsfield, Scott Gregory, Sky Sports Golf, U.S. Amateur Championship. Bookmark the permalink. To receive an email alert when I post a new amateur golf article insert your e-mail address below and click 'Subscribe'.